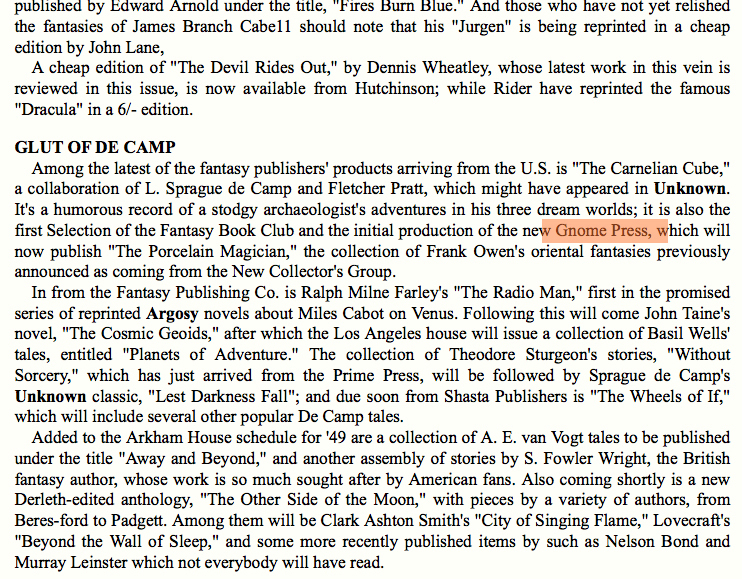 I’ve been sorely remiss in posting about correspondence I’ve had in the past year or so regarding Gnome Press. Well… ‘sorely remiss’ is a kind of euphemism really. Putting it succinctly, I’ve just been f***ing lazy. Time to catch up and pay some dues. 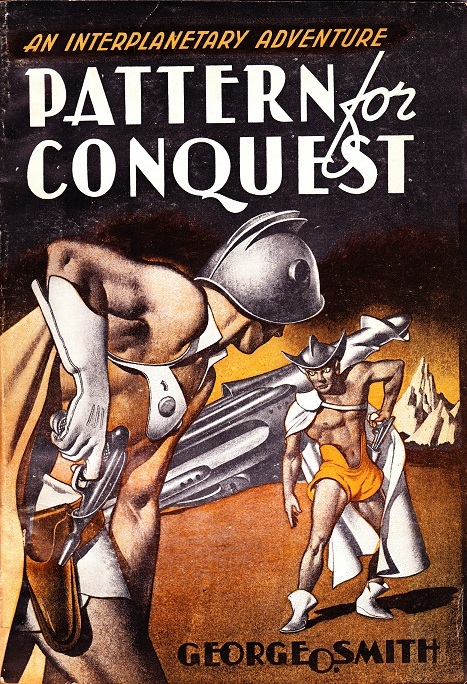 A while back I bought the Armed Forces paperback issue of Pattern for Conquest from Morgan Wallace. He was kind enough to enlighten me as to his GP interest. 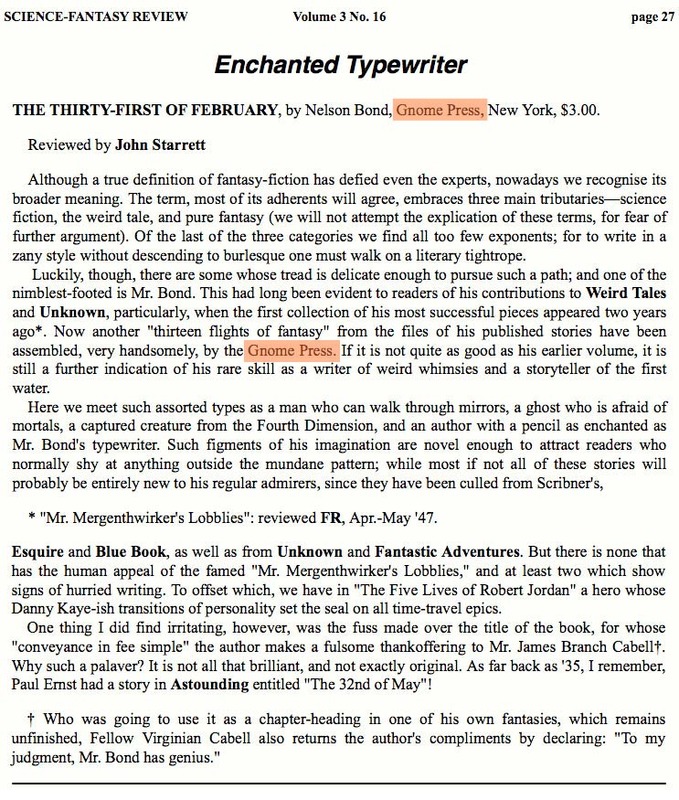 He has all four Gnome paperback issues, and actually wrote a piece for Paperback Parade in 2005 outlining the history of the Gnome Press paperback dalliance. 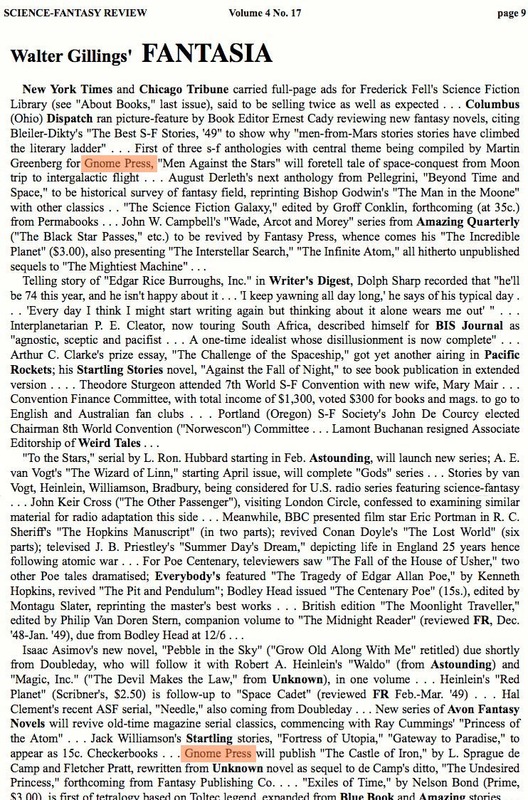 Morgan sent me scans of his article and of the four GP paperback titles. Here is first the piece and then his covers. Many thanks for these Morgan. They are greatly appreciated and a fantastic addition here at the Odyssey. They’ll make a permanent home over on the Trivia page. Just picked up Seetee Ship by Will Stewart on eBay for an excellent price. We’ll see the reality when it arrives. I’ve had a couple of disappointments lately, so I’m trying not to get too excited. I am also expecting Lost Continents to turn up in the next week, and there’s a copy of Tros of Samothrace coming up on eBay. I’ve never seen it available in auction before so I’m aiming for that as well. At the moment I’m out in the countryside just north of Seoul doing English language immersion camps. Actually, this is third consecutive camp since I started here on December 14th. The first two were two weeks each and this one is for three weeks, so I’m not done until February 4th. The place we’re at is called The Transnational Law and Business University and they run these camps for elementary and middle school kids during winter and summer vacations. 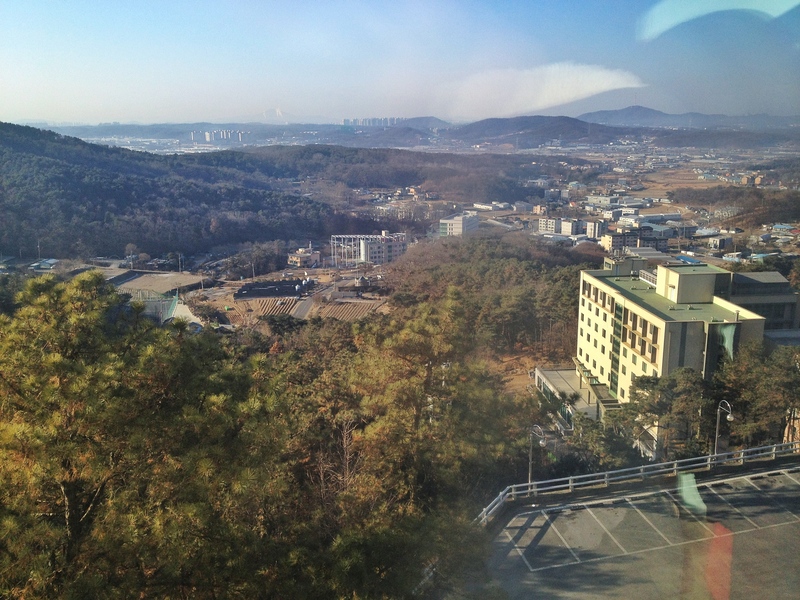 It’s located within the bounds of Goyang City, but it’s up the side of a hill in the countryside. This is looking more or less west today from my classroom on the 5th floor. It’s kind of remote (by Korean standards) – I have to walk about 20 minutes to get to a convenience store. It’s also very cold at the moment. Back to GP. I’m closing in on the 75% mark – only two more titles to pick up. I’m into the realms of books that for the most part can’t be just picked up on a whim off eBay or a vendor somewhere online. 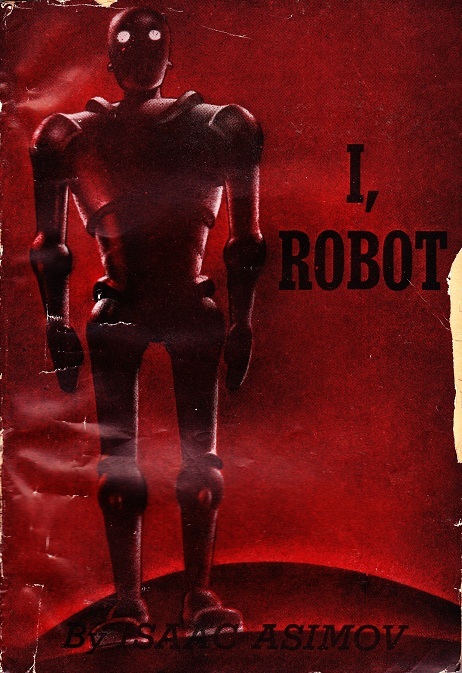 Many of the remaining titles are truly sought after and have to be saved and planned for, such as the Foundation series, I, Robot, City, Methuselah’s Children, the Conan titles… I’ll need to be more methodical and considered in my pursuit of the remaining books. Picked up a couple more titles over the last couple of days. Both look to be in excellent condition too. They’d Rather be Right by Mark Clifton & Frank Riley and Pohl’s Drunkard’s Walk. They should be here sometime in the next couple of weeks. Also received some much needed Brodart dust jacket covers a week or so ago as well. 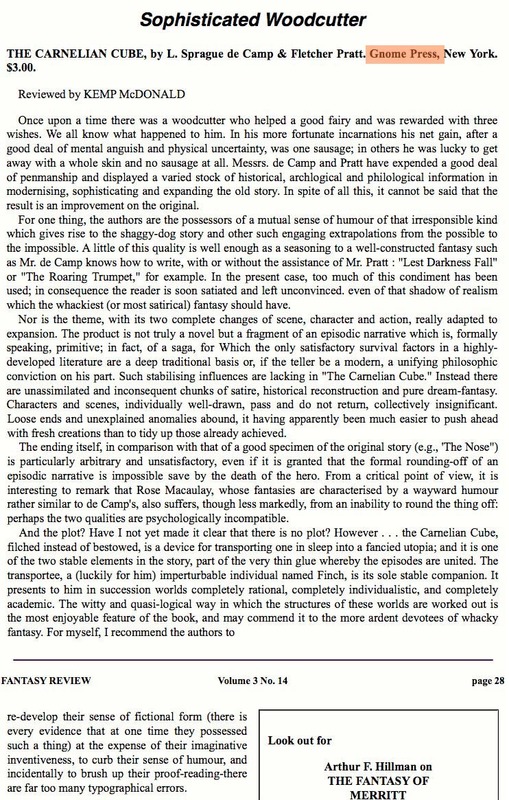 I’m feeling mighty pleased as I grabbed a copy of the Limited Edition of Nelson Bond’s The Thirty-First of February (Review, Close Up) off eBay last night. It looks to be a reasonable copy, and for just over $50, I think it’s a great buy. These things are very rare. Goddamn, I wish I was set up to do decent Close Ups at the moment… Speaking of which, I do have a couple I can post that have been sitting over on my Flickr account for a while. This is a post from about 10 months ago that I never hit the ‘Publish’ button on. I have several drafts of things lying around that I’ll try to make headway on over the next couple of weeks. eFanzines.com. What a great site to peruse. 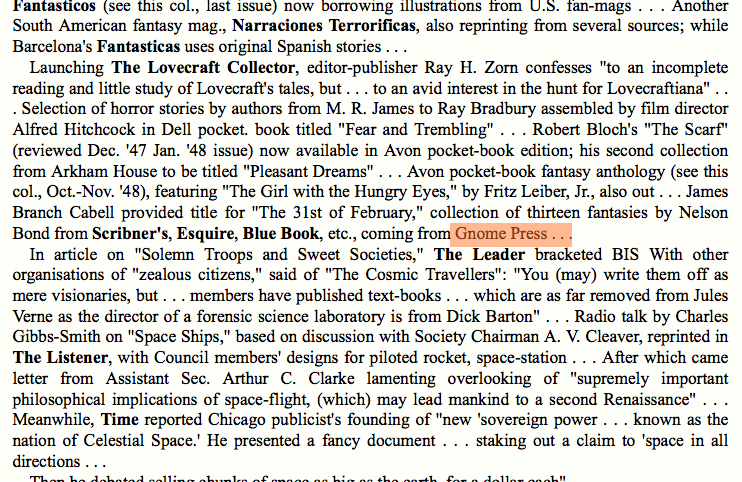 There’s stacks of material on early SF. 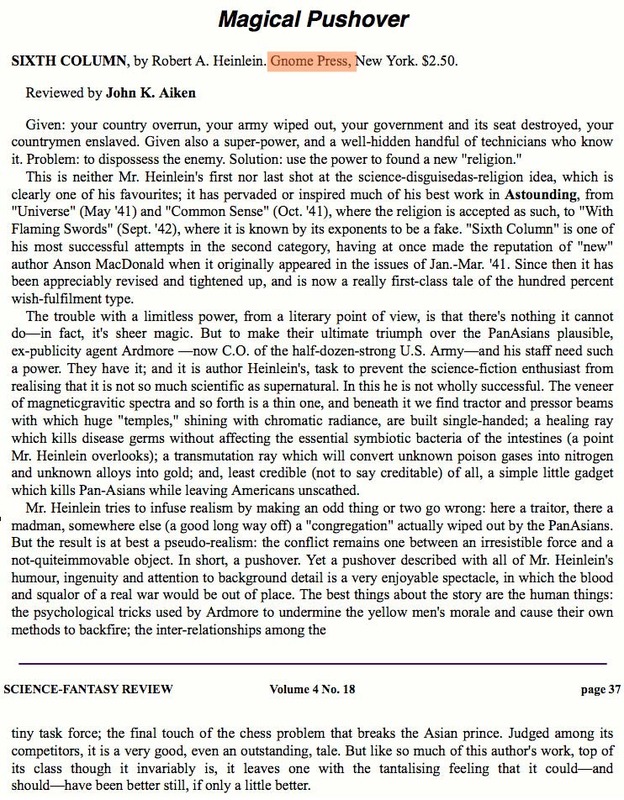 Something I came across was the recently stocked archive of the Fantasy Review/Science-Fantasy Review – a newsletter for at first Fantasy, and then F/SF fans in the UK. 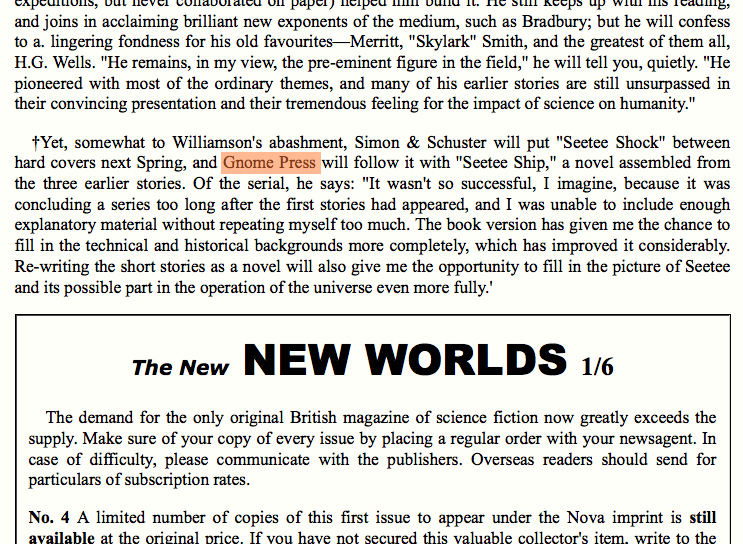 There are some fantastic articles and reviews contained in these magazines, it really is a Golden Age goldmine. You can access the entire archive here. 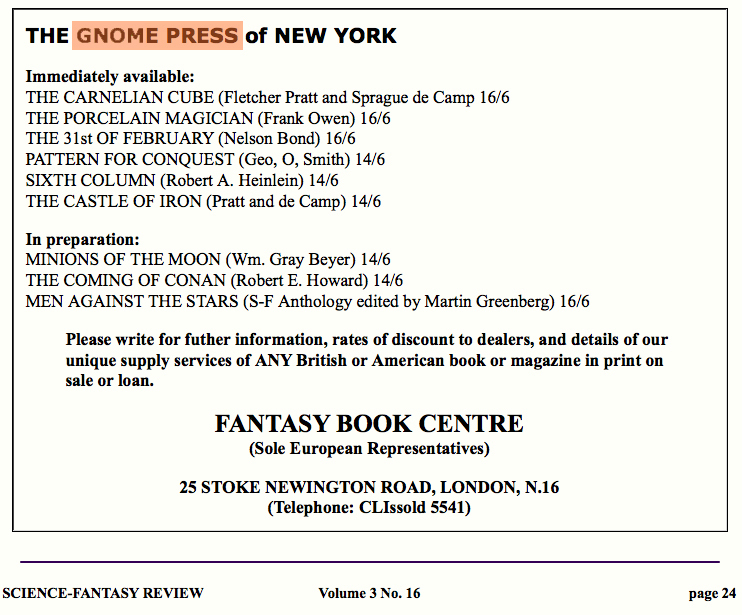 Of interest to us in the context of this site is that the final few issues coincided with the genesis of Gnome Press. 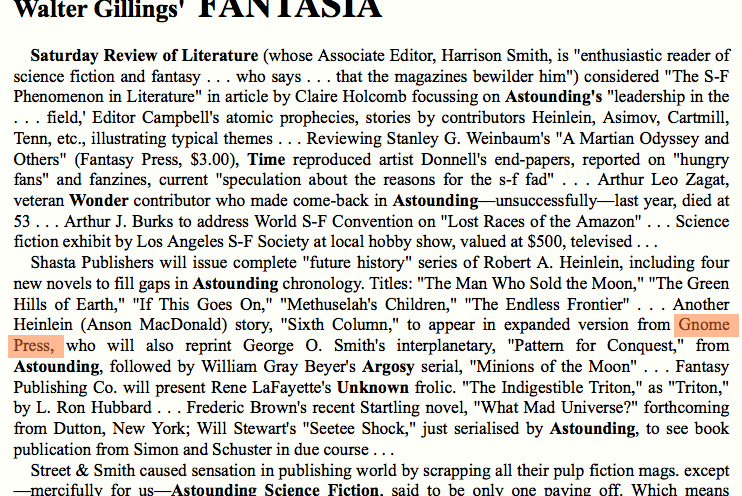 I want to share those particular references (from 1949 & ’50) with you here in their original form, and I also highly recommend you go and check out these publications in their entirety at the eFanzines site. There we have it. 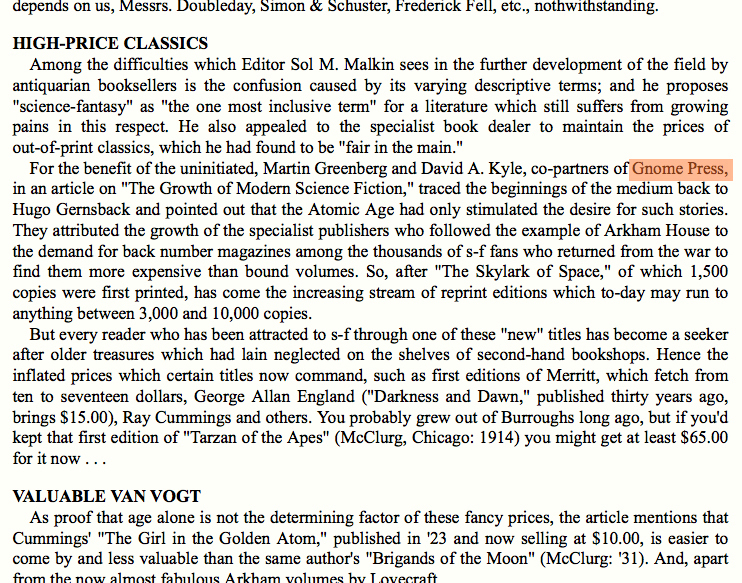 You will have noticed several book reviews for early GP titles. Contemporary reviews of these books are incredibly hard to come by and it’s very special to have these available. 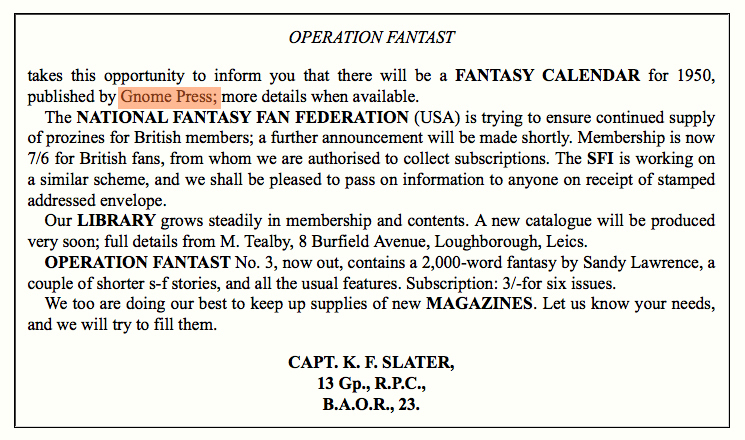 This is just a small taste of the treasure trove of Golden Age trivia, comment and review that these newsletters are. Go and check them out. 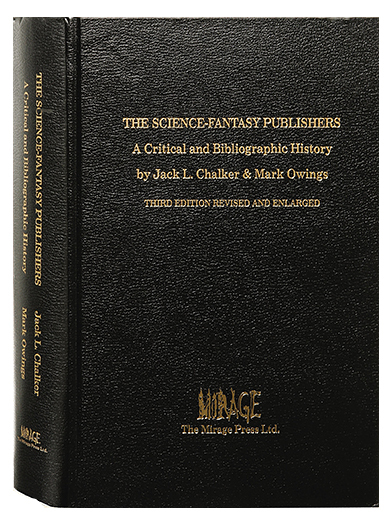 A few months ago, I got hold of the CD version of The Science-Fantasy Publishers: A Bibliographic History 1923-2002 Electronic Edition by Jack L. Chalker & Mark Owings. 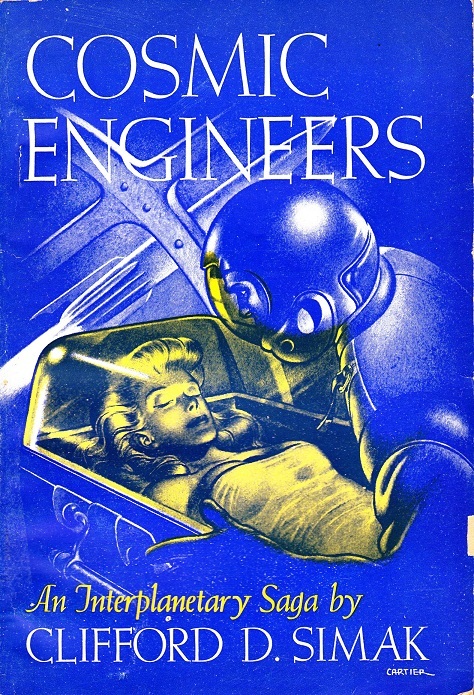 Here is an image of the Third Edition from which the Electronic Edition is based. 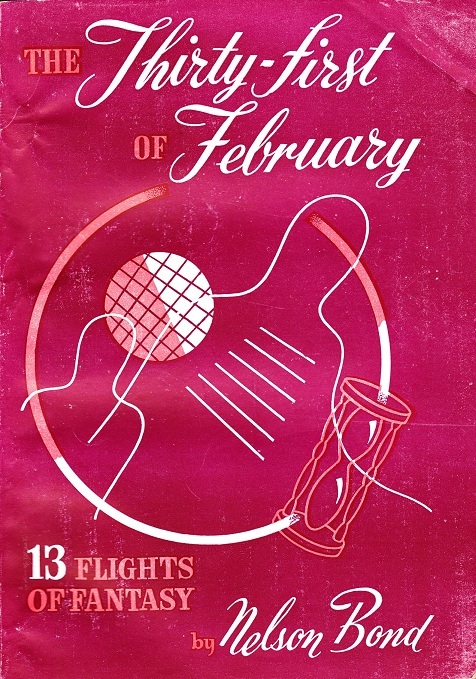 It was published by Mirage Press whom seem to be defunct now. 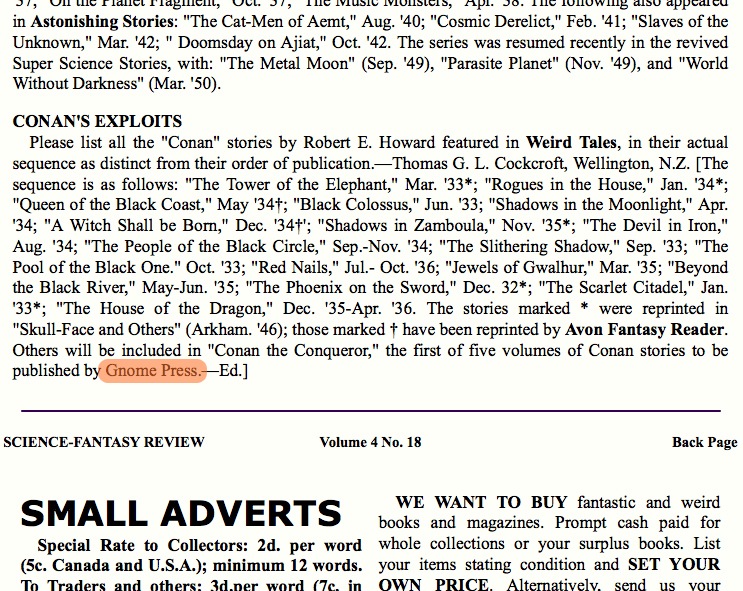 This work is a must for any serious collector of Science Fiction or Fantasy. 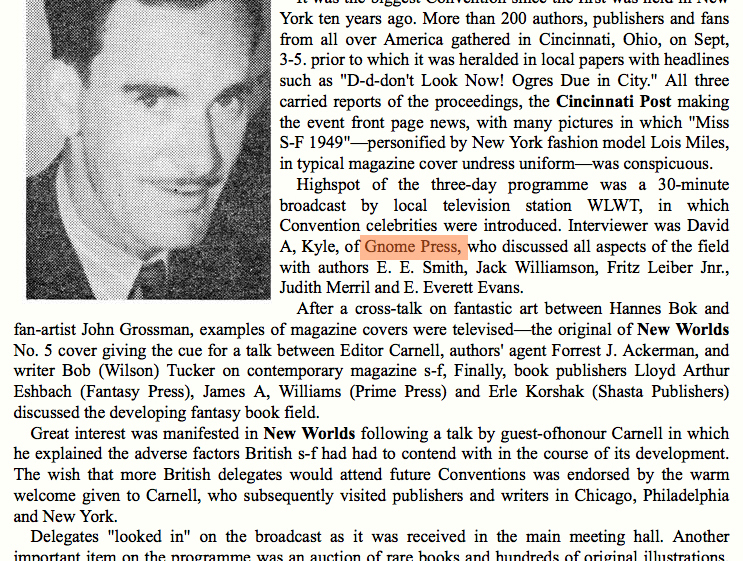 Speaking from the Gnome Press perspective, there is some fantastic insight into their history and many great little tidbits of information along with the bio on each title. 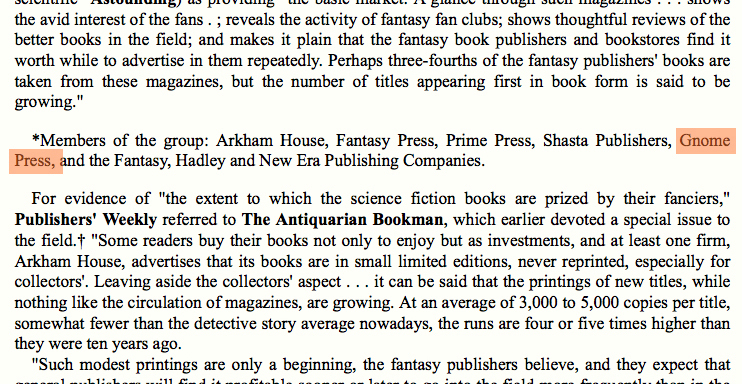 This is true of every other publisher covered in this comprehensive tome. I was going to present the Gnome section of the work here in a post, but I think I’ll start a new page on this blog for third-party GP info such as this. I just did. You can find it here. I hope nobody minds, it’s here for the edification of all. 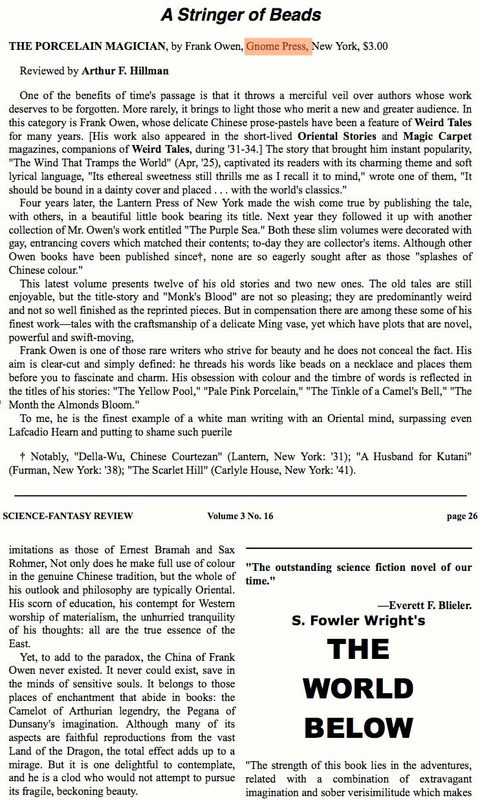 Below though, is the preface and introduction to the volume. I thought it worth delivering also as it gives a detailed insight into the reasons and methodology behind the reference. It really is a fascinating read. 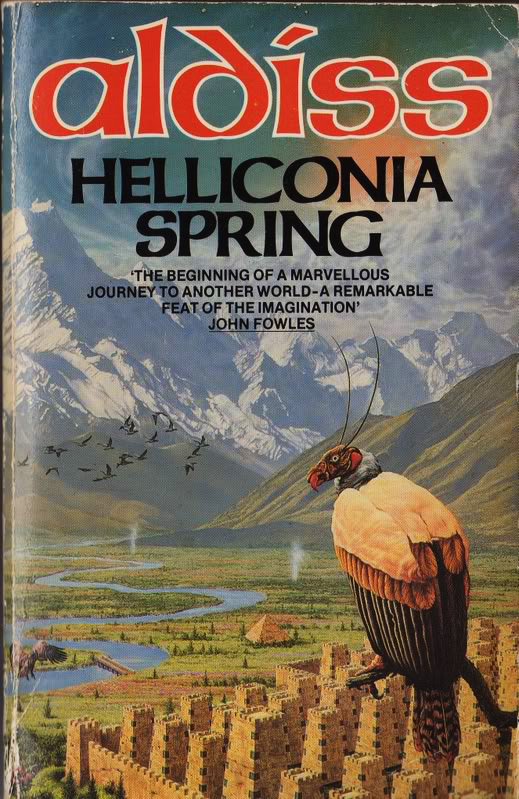 I really stress once more, if you are a collector of science fiction and/or fantasy, or even just interested in the history surrounding the publishing of these genres, then I unreservedly recommend getting hold of this.